I wasted enough seconds today with sadness and anger…moments when I should have been looking at Matthew’s eyelashes, playing Hungry Hungry Hippos with Katie, or holding Craig’s hand. I love your new header….my two favorite colors of the holiday season, plus it reminds me of Katie and her gratitude bowl! I wrote to you on babble, but it doesn't hurt to give u HUGS here too…HUGS! Thinking of you and I hope you know just how much. Sending hugs. I imagine it's not easy allowing yourself to be so vulnerable, but thank you for sharing your struggles with us, your readers. I hope we can be an encouragement to you, as you are to so many of us. What a beautiful little boy you have there! 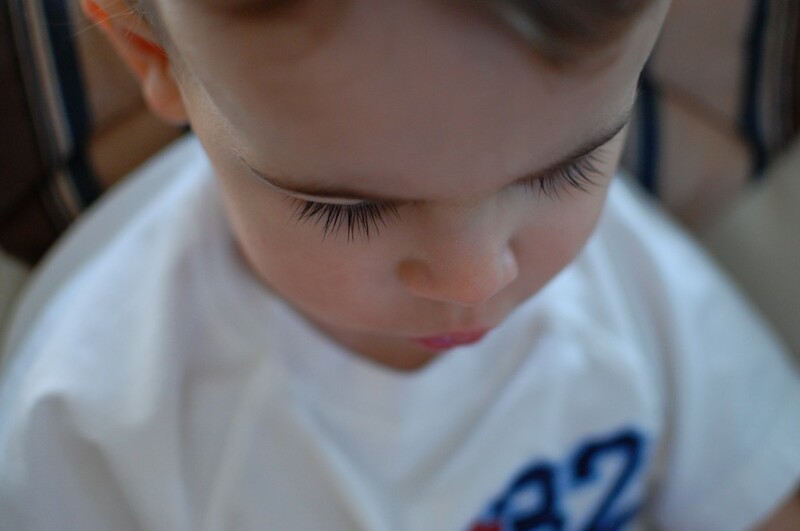 I love staring at my little one's lashes too…brings a sudden smile to my face =). I think sometimes it takes a few tries? 🙁 I think you could find comfort in knowing you are doing everything possible to make this happen for your family. I know it doesn't make things much easier but you are not holding back on any front. You are like wonder woman right now. I am praying for you and wishing you the best of luck. Drink a bottle of wine and try not to count the days until your next smiley face on a stick. <3 Sending love. Okay. Ralph may be right. But you're allowed a few minutes (and a few hundred seconds at least) to be angry. I can only imagine how difficult it is to balance so much hope and so much love with so much of the unknown. And then you know…and it is hard. And I'm wishing you happiness today. As usual, I agree with Julie. You are allowed to give yourself the crying and the anger and the tears. You heart is fragile. It's ok to give it what it needs to cope. hoping today has brought you a reason to smile. with your heart. Playing Hungry Hungry Hippos always puts me in a better mood. Beautiful eye lashes! Not to preach, but even the Bible says "be angry and sin not". So do be too hard on yourself. Thanks for you sweet comments on my post! So short, and so much contained in so few words! We are allowed to be angry and sad and all the other negative feelings. It's what makes us grow stronger. Getting angry is a normal reaction. We all have those moments we'd like to take back…but you just have to truck on forward. I really think its ok to feel both. We just have to try not to remain in that negative frame of mind to long, right? Far to many blessings to dwell. Positive energy coming you way from here…. Spend time doing what makes you happy. Hugs your way.